Who doesn't enjoy a nice piece of dark chocolate?? I do, I do, I do! Add some raisins in there and forget about it...I'm in heaven. Or some spice! There are so many health benefits for dark chocolate! It lowers not only blood pressure, but also lowers cholesterol. Serotonin is also in chocolate, which is an anti-depressant. Traces of caffeine is found in dark chocolate...keeps you stimulated. 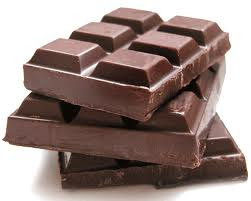 Epicatechin can be found in dark chocolate, which improves memory. Interesting fact from Healthy Diaries: "Jeanne Calment, the world's longest-lived person lived to the age of 122 and many ascribed her longevity in part to her consumption of 2.5 pounds of dark chocolate a week." Interesting, right? Check out today's Tasty Tuesday for a delicious recipe with chocolate! And please do not replace healthy foods for chocolate. While chocolate IS healthy - remember, moderation is key. If you currently eat a sweet treat in your diet - switch it up for a piece of dark chocolate. (Note - I said a piece...not a whole chocolate bar.) One ounce per day is plenty. I might be the only person out there who doesn't like dark chocolate. It's sad I know!! Dark chocolate does have such great health benefits too! I love me some chocolate so seeing that a little here and there is actually healthy makes me a happy girl! Chocolate love! I don't like dark chocolate either, Jayme! I hate how bitter it is! 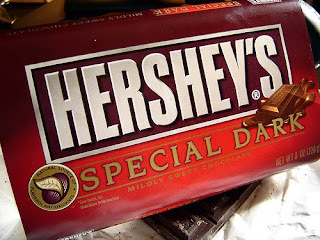 i had 2 small pieces of hershey's dark tonight. :) they are so good with wine or even a cup of coffee!